Hall of Gods is a five-reel and 20 pay lines slot by Net Entertainment. The game has flexible betting sizes which are ideal for High rollers and at the same time budget players. The bet size starts at 0.01 and goes up to 0.50 per line, and you can wager 1-5 coins per pay line. The minimum bet is 0.01, and the max bet is 50.00 per spin. Idun a goddess of apples and youth. Hall of Gods sets an ambiance of ancient battles featuring the Norse gods with detailed graphics to represent all the gods in the war. The audio plays a significant role in complementing the feel of the battlefield and add to the excitement of the game. 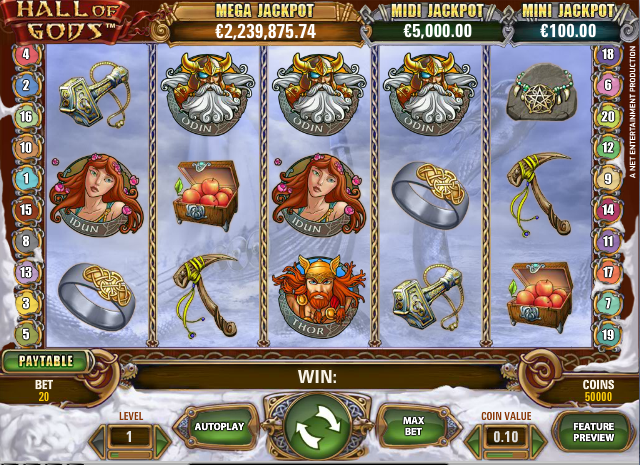 The game has expanding wilds, free spins, scatters and a bonus game with three different progressive jackpots. Players are allowed to make 20 bet lines at the bet level of their choice as long as the bet falls within the given range. Hall of God has other automated features. One such feature is the “AutoPlay”. AutoPlay lets you play Hall of Gods at a pre-configured number of rounds. All you are needed to do is click on “AutoPlay” choose the number of spins and Bingo! You can stop the Auto Play function at any time you deem necessary. Advanced settings in this feature allow you to set the amount of money you intend to lose or gain. Hall of God has a bonus game where players get the chance to win any one of the three jackpots. To activate the bonus game in Hall of Gods is as easy as landing three bonus symbols or triggering the free spins. When you get to the bonus round, the game symbols turn to shields and your pointer turns to the mighty Thor’s hammer. You will then use a hammer to break the shields and match the three jackpot symbols or coin amounts. You win the amount shown if you manage to match the three jackpots; Mega Jackpot, Medi Jackpot and Mini Jackpot. The scatter symbols award the free spins. If you land three scatter, you are rewarded with ten free spins. If you land four scatters, you get 15 free spins, and if you manage all five, you get 20 free spins. During the free spins, you can re-trigger the freebies by landing more than three scatter symbols.